I try to be as health-conscious as they come, but I love baked goods. Now, I know that these food items are not usually nutritionally sound, but I do have an exception in my dietary repertoire. I love fresh pies, especially if they are homemade with loving care. And what could be better than your grandmother’s apple pie? Well, my answer is pumpkin pie. The taste, the mouth-feel, the smoothness, warmth and satisfaction I get from eating this pie is simply magnificent. I will eat this pie cold, hot and with or without ice cream. I have even been known to eat this pie for breakfast—as part of a nutritious breakfast, in fact. 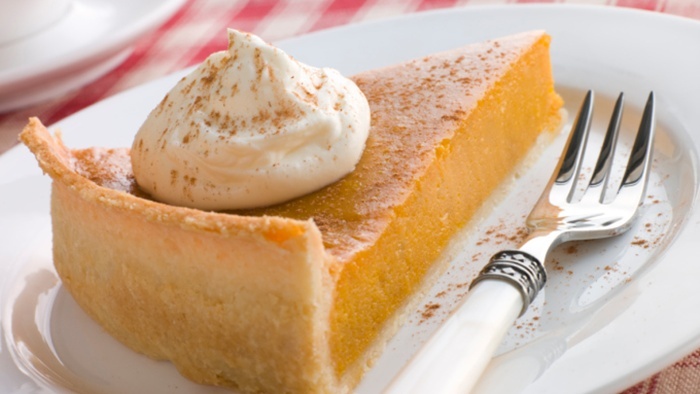 In many ways, pumpkin pie is a nutritional superstar (mind the pastry shell). Pumpkin, much like by favorite tuber, sweet potato, is full of the same type of nutrients that promote good health. Cooked pumpkin provides soluble fiber, which is necessary to keep your blood pressure and blood cholesterol levels lower. Pumpkin is also great for your gut because it helps feed the normal flora residing there and keeps you regular. Pumpkin is also an excellent complex carbohydrate; it’s lower on the glycemic scale, so it’s able to stabilize your blood sugar without causing large increases in insulin secretion. Need more to be convinced? Pumpkin is also one of the best sources of vitamin C and beta-carotene in nature. And it contains reasonable amounts of the minerals potassium and manganese which balance the water and electrolytes in our cells. Vitamin C is essential as the major water-soluble human antioxidant; it’s essential for proper wound healing, immune function, blood clotting and connective tissue repair. The nutrient beta-carotene has several different functions in the human body. It converts to vitamin A which helps with night vision and our immune response. Carotenoids like beta-carotene also act as important free-radical scavengers throughout the human body. The difference is that they are fat-soluble so they are taken up by fat and transported to our cell membranes and other fatty structures where they protect them from oxidation (break-down) caused by free radicals. Consuming foods like sweet potato and pumpkin that are high in antioxidant nutrients and fiber have been shown to reduce the risk of developing heart disease, high blood pressure, cancer, diabetes and stroke. I recommend using canned raw pumpkin as fresh pumpkin is seasonal and may not always be available. Canned pumpkin can be used to make excellent and healthy baked goods including pies, loaves and muffins. All you need to do is add the nutmeg, cinnamon, Splenda or other sweetener, 5% cream and a small amount of clove. Puree this mixture for your pumpkin delicacy. “What are the health benefits of pumpkin?” Medical News Today website, July 16, 2014; http://www.medicalnewstoday.com/articles/279610.php, last accessed July 16, 2014.